Yellow Rocket is a biennial plant grows to about 30-60 cm tall, with a maximum of 1 m. The stem is ribbed and hairless, branched at the base. It has a basal rosettes of shiny, dark green leaves. The basal leaves are stalked and lyre-pinnatifid, that is with a large terminal lobe and smaller lower lobes. The stem leaves are smaller, ovate, toothed or lobed. The flowers are borne in spring in dense terminal clusters above the foliage. They are 7-9 mm long, with four bright yellow petals. The fruit is a pod about 1.5-3 cm long. 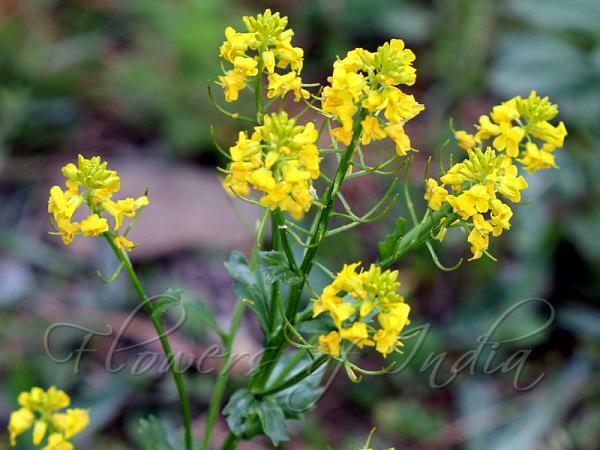 Yellow Rocket is found in the Himalayas from Pakistan to Uttarakhand, at altitudes of 2400-3300 m. Flowering: May-June. Photographed in Gulmarg & Pahalgam, Kashmir.